Start by clicking on Theme Options in the left-hand admin menu and choose General. This option allows you to upload a Custom Logo to replace the default theme logo/title text. The dimensions are purely up to you, however it should not exceed 300 pixels wide, or 100 pixels tall. Click on Browse to upload an image file from your hard-drive, or enter the URL of your image file if it is hosted elsewhere. If you upload a large logo, see this post for adjustments you will need to make. You can upload as many logos as you like and then simply switch to the one you prefer by clicking on the thumbnail. 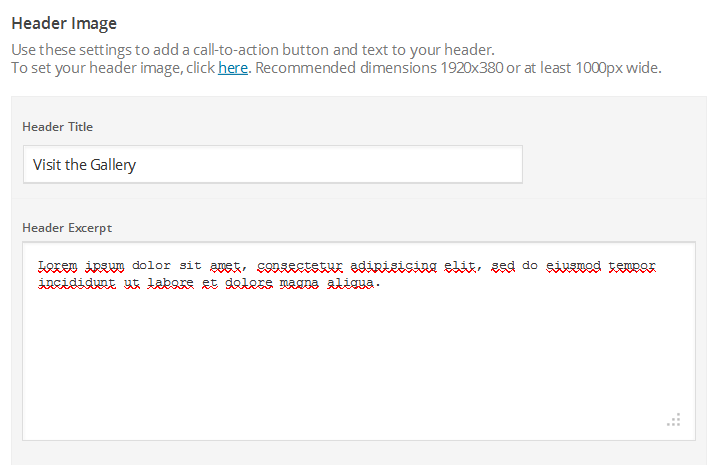 WordPress accepts .jpg, .png and .gif. This option allows you to upload a favicon, which is the tiny icon displayed in the browser address bar when visitors view your site. The dimensions should be 16 x 16 pixels. Click on Browse to upload an image file from your hard-drive, or enter the URL of your image file if it is hosted elsewhere. You can upload as many logos as you like and then simply switch to the one you prefer by clicking on the thumbnail. For best results, your favicon should be a .gif or 24-bit .png. You should not use a .jpg as it will probably not display. Picks comes with two color schemes. Select an option from the drop-down. Dark is set by default. This option allows you to disable the theme's OpenGraph support if you are using a plugin that duplicates the feature and does not allow disabling it. If left on, you may set a default site image for Facebook to use if it cannot find a featured image on the page or post being shared. Your image must be at least 200px by 200px. View this article for more on Facebook OpenGraph and how it works in your theme. Date – Uncheck to turn off date. Does not affect events. Tags – Check to show tags on single posts. Social Sharing – Uncheck to disable sharing on photos and posts. Direct Link – Uncheck to disable Direct Link on photos and posts. Enter the URL to your custom feed, such as Feedburner if you have one. If left blank, the default WordPress RSS URLs will be used. This secion allows you to choose a layout for your homepage. The full width layout gives you the ability to have a full width layout showcasing your photos in a grid similar to Instagram. The widget driven layout lets you determine how to layout your homepage via widgets. Get started by going to Appearance → Widgets. For details on using widgets, see Setup Your Widgets. You may prefer to use Picks as a traditional blog. This is achieved by choosing the ‘Blog Layout’ from Homepage layout. Using this page template will display your latest Posts (standard and video) in chronological order. Click the image tab to set a layout. When finished with configuring Theme Options, go to Settings → Reading and ensure Latest Posts is selected. If an image is uploaded, the header will appear on all pages except the single posts and gallery categories. Dimensions mentioned here are all suggestions – WordPress is looking specifically for a 2000x520px image so this is the size you should use if at all possible. You must have one of these fields entered for the collage header to appear, and no static background set. We recommend uploading an image of 2000 x 520 pixels as your header image, or at least 1920×500. Click on Choose file/Browse to upload your image or optionally click Choose Image to select an existing image from your WordPress Media Library/Easygram feed. This section gives you some control over the copyright area of the footer. All of our themes come with an Obox Logo at the bottom right of the footer. To switch this off, simply uncheck the box (although you get extra awesome points for leaving it on!) You may also replace the default copyright text with your own. For example: “Copyright © YourSiteName”. Don’t put code in this box, it won’t work! If you would like a quick and painless way to implement Google Analytics, paste your preferred tracking code into this text area. Your code will then be inserted into the footer of the theme, which is best for performance reasons. If you wish to use a social sharing plugin, you can paste the template tag or code in the box provided. The social icons display in the sidebar or footer of the Picks layout depending on where you choose to place the widget. Enter the full profile URL of each relevant social network in the fields provided.